Browse > Home / Reviews / Krabi Jacuzzi Spa In The Jungle. Krabi Jacuzzi Spa In The Jungle. This is gem. Even Rachel has never seen these pictures before. My first ever trip to Krabi in 2003 with my colleagues and friends. Not much people know about this Krabi Hot Spring. In fact, the guide who brought us there only went there once with us. We traveled by bus back then from Kuala Lumpur to Trang and back to Krabi, Hadyai and back to Kuala Lumpur. We went to the hot spring while we were in Krabi. Now, the only way to the Khlong Thom hot spring is through the Krabi Rainforest Day Tour. I read this from many other websites such as this one from KrabiDiscovery.com. 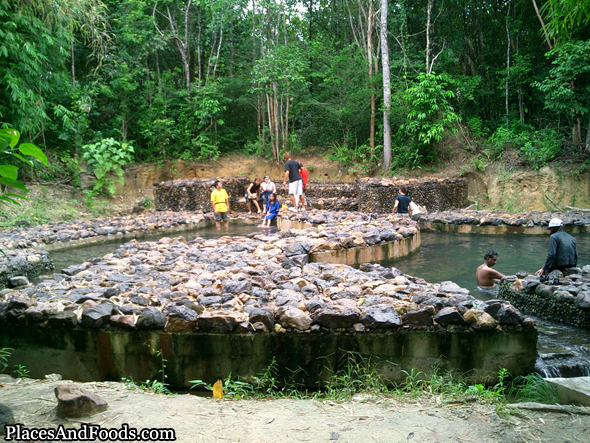 Hidden in the rain forest of Krabi lies a few hot springs that is well maintained back then. The temperature of the hot spring was not really that hot and warm but it was enough to keep the body comfortable. I wasn’t told about the hot spring so I didn’t bring clothes for it and also I was told that the water contains a multiple types of mineral, and it was good enough to tempt me to jump to the hot spring myself. Stripped in public and clad with my underwear, I dived into the hot spring. Well, not forgetting fellow friend Jack also joined me for the jacuzzi spa in nature. A short dipped into the hot spring, really refreshed our body and soul. Looking on our enjoyment, 2 Singaporean girls stripped and jumped to the pool as well. While the rest looked at us in envy, it was a refreshing moment. We didn’t manage to go to the Emerald pool but this was good enough. This was us back then when I was much sexier. The picture is taken at the entrance of the hot spring. I’m happy to share this even though this was years ago. This is recommended for nature lover as the tour includes the rain forest tour. Please contact any local tours with the Krabi Rainforest Day Tour that inclusive of the hot spring package. Tour rates differ from one and another. Good Luck!